Differences in arbuscular mycorrhizal colonization and P acquisition between genotypes of the tropical Brachiaria grasses: is there a relation with BNI activity? In a field experiment in Palmira, Colombia, we studied mycorrhizal root colonization, phosphomonoesterase activities and P and N foliar content before and after N fertilization among different Brachiaria genotypes with demonstrated biological nitrification inhibition (BNI) capacity. Furthermore, we tested the potential nitrification rate (PNR) in soil in order to confirm the inhibition of nitrification of the selected genotypes and relate the BNI performance with P acquisition. We hypothesized that (i) genotypes will differ in key variables related to P acquisition, and that there will be a positive correlation between (ii) arbuscular mycorrhizal fungi (AMF) root colonization, P uptake, and BNI activity, and (iii) between the activity of acid and alkaline phosphomonoesterase and BNI performance. Higher N immobilization 1 week after application of synthetic fertilizer (ammonium sulfate) and low PNR of Brachiaria humidicola CIAT 679 and CIAT 16888 confirmed that these genotypes have high-BNI activity. Despite the relatively high soil P status, high affinity of Brachiaria grasses for AMF was observed at the study site: more than 60% of root length was colonized by AMF in high-BNI genotypes, versus 45% in low-BNI Brachiaria cv. Mulato. The N content of high-BNI genotypes was positively correlated with mycorrhizal root colonization suggesting the uptake of NH4+ by AMF and its transfer to high-BNI genotypes and/or regulation of AMF colonization by P demand. Furthermore, increased activity of acid phosphomonoesterase (6.98 and 7.68 μmol g−1 h−1 in high-BNI versus 5.20 μmol g−1 h−1 in low-BNI genotypes) and the depletion of the most labile available P fractions in the rhizosphere of high-BNI genotypes (by 21–32%) suggest enhanced P uptake and P-use efficiency. To the best of our knowledge, this is the first study that explored relations between BNI and biotic factors affecting P acquisition. 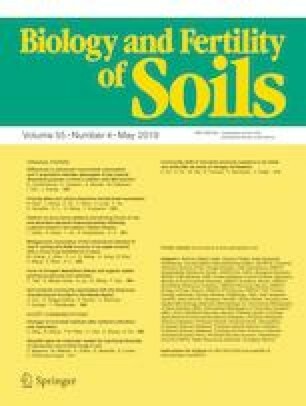 Our results highlight the importance of AMF in Brachiaria grasses even under high P availability and warrant further studies including a larger number of different BNI genotypes that can elucidate biotic plant-soil interactions affecting nutrient-use efficiencies in improved pastures under low and high P status. Eduardo Vázquez thanks the Spanish Ministry of Education for his FPU fellowship. Nikola Teutscherova thanks Cátedra Rafael Dal-Re/TRAGSA. Special thanks belong to Gonzalo Borrero for the phosphorus fractionation analysis. This study was undertaken as part of the LivestockPlus project funded by the CGIAR Research Program (CRP) on Climate Change, Agriculture and Food Security (CCAFS), which is a strategic partnership of CGIAR and Future Earth. In addition, this work was also done as part of the Livestock CRP. We thank all donors that globally support the work of the CRP programs through their contributions to the CGIAR system. Financial support was also obtained from the Internal Grant Agency of Czech University of Life Sciences Prague (no. 20185004, and no. 20185020).